He was referring to Nixon’s comprehensive plan to restore black and brown communities decimated by the war on drugs, which includes funding public schools, job training, expunging the drug records of criminals with marijuana convictions, investing state tax revenue generated from dispensaries in poor communities, and providing financial assistance and small business support to black and brown people interested in owning a dispensary. She even shouted out the successful reparation programs in Oakland, Calif., and Massachusetts as models and proof that as marijuana legalization spreads across the nation, and as white people become millionaires for selling the same drug that put black and brown people in cages, other liberal states are fulfilling their moral obligation to make sure minorities harmed by the drug war are not left out. Of all people, the governor of the state where Rockefeller drug laws and stop and frisk wreaked havoc on black and brown communities should know racial and criminal injustice starts with being black or brown and over-policed, which leads to arrests, sentencing and incarceration, which turns blacks and Latinos who possess small amounts of marijuana into criminals and permanent pariahs, rendering them ineligible for employment, public housing and education benefits for life. In New York, 87 percent of those arrested in recent years have been black or brown, a proportion that has remained roughly the same for decades, (pdf). This state has separated more than 125,000 children from their incarcerated parent (pdf) and devastated poor communities while pouring billions into prisons. How is Cuomo so callous that he refuses to acknowledge the damage that state-sponsored terrorism has done to black people? The cannabis industry is lucrative and is expected to grow to a more than $20 billion by 2022, but a felony conviction will prevent people of color released from prison on a marijuana-possession charge from getting a job at a dispensary, despite being experienced. And owning a dispensary will be even harder since it costs at least $250,000 in capital to start a marijuana business, money most black people don’t have and cannot access. Nixon’s plan to expunge criminal records, make dispensary licenses affordable and provide small-business loans to minorities would give black people a shot at the American dream. Cuomo’s plan is a gold rush for white people. 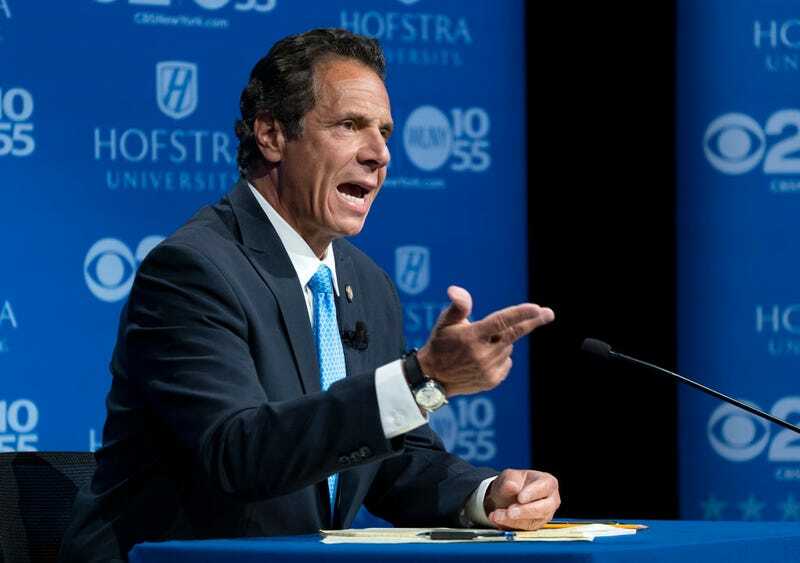 Andrew Cuomo is a Trumpian law-and-order Democrat and a former prosecutor who, until two months ago, was staunchly opposed to marijuana legalization, calling it a “gateway drug” despite scientific evidence to the contrary. His ignorance about marijuana lends credibility to the speculation that his sudden support for marijuana legalization is not genuine and is because of Nixon’s challenge to him from the left, along with his fear of losing the primary election on Thursday like his friend, Joe Crowley, who lost to Alexandria Ocasio-Cortez. Fortunately for black people in Oakland, their black leaders embraced reparations for damage from the war on drugs and they have turned convicts into entrepreneurs in a multibillion dollar industry. And in Massachusetts, Ayanna Pressley, who won congressional nomination last week, has pushed her state to include minorities in the marijuana business and distribute licenses fairly. I hope black and brown New Yorkers do not allow black leaders and their respectability politics to shut us out of America’s profitable marijuana boom. Let’s support the candidate with the morals and the courage to right unjust wrongs and elect Cynthia Nixon because weed should be lucrative for more than just white people.